And it hit me- she’s right. We’ve been on No Sugar for ten months now… which means we’re, uh… we’re… five-sixths of the way done! It does make me glad to know we’ve made it this far, and that, despite several dreams I’ve had to the contrary, I haven’t suddenly forgotten the project and ordered a hot fudge sundae, only to suddenly, panic-stricken, remember- gasp! The Project!- half-way through eating it. (Yes, I’ve really had those dreams. Sometimes they’re petit fours. I don’t know why. I’m like, “Petit fours? Really?”) I’m also glad, of course, because some days No Sugar can be a certified pain in the tookas. Looking back lo those many months ago when we first started out though, I can discern in myself a bit of the wide-eyed zealot, which I think you kind of have to be in order to attempt a project of this magnitude, and truthfully, obnoxiousness. I had some weird degree of fun in finding the sugar where we least expected it… as if to say: look! See? I’m not crazy! They’re the ones that are crazy!?! See! Ha ha! Why are you all looking at me funny? Nowadays, I know the drill. I know it so well it can be maddening. I could play parlor tricks with my wealth of fructose knowledge. (“Go ahead, check the ingredient list. It’s there. Yeah, I’ll wait.”) We rarely make rookie mistakes anymore, no longer bring home things we haven’t read the teeny-tiny ingredient-print of closely enough. We know which items on the restaurant menus are safe and which are verboten before we even ask. Our lapses aren’t the exciting “Whoops, I had a chocolate eclair!” variety, but rather the mundane items we know better about: my husband Steve looks the other way while I eat a sandwich roll which undoubtedly was made with some minuscule amount of sugar… and I try not to look askance at him while he leaves the bacon pieces on his restaurant salad. Bless me father for I have sinned… I had impure thoughts about my neighbor’s shrimp cocktail sauce. She gave me a look that said she’s pretty sure I couldn’t possibly be that stupid. “They’re cookies, Mom!” she patiently explained. I felt bad, then, when she had to come back and spit the cookie into the sink. Love how I sound totally illiterate. I know perfectly well its the sugar project not “this thing”. Guess I was trying to underplay it. 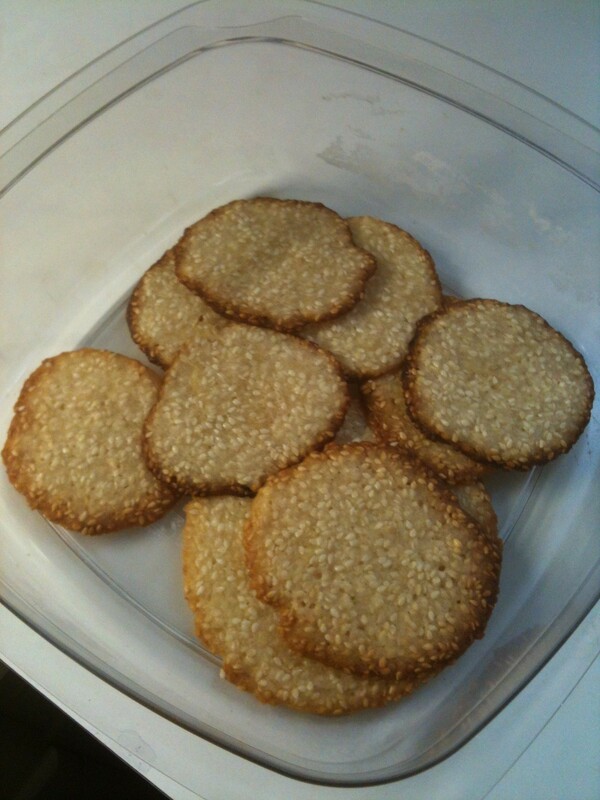 Sorry Ilsa didn’t like those sesame cookies, but I’m sure you were able to improve the recipe. You’ve given this great effort and needn’t worry that the journey hasn’t been perfect. A professor once noted that although a research project I had undertaken was inconclusive in its findings, I had learned a great deal about the challenges of conducting research. Sometimes we find that the process we use to reach a goal may be more important than the original goal itself. I wish you staying power for the final stretch. I’ve been off sugar 14 months and can totally identify with the loudspeaker in the head being so much quieter. It can be silent for days. And then I eat a large orange….and I have several hours of it being back on again. This is fascinating, because I once thought it was normal to live with this continuous sense of temptation! Now I see where it comes from. You are currently reading A Year Of No Sugar: Post 78 at Eve O. Schaub.